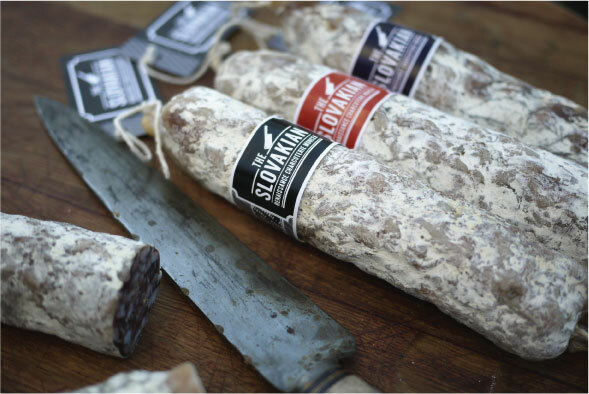 The Slovakian is a boutique charcuterie specializing in slow fermented sausages. 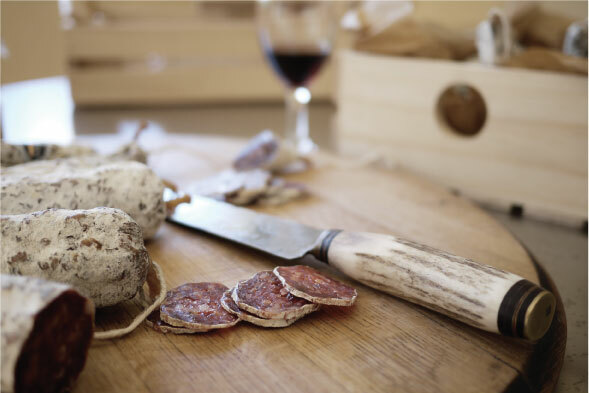 In Renaissance Charcuterie Moncek, Marian Moncek revives his old family tradition dating back to his distant relatives the D'Monchet of French Normandie. By only using the best available ingredients such as hand harvested sea salt, Pimenton de la Vera and always being on the lookout for the best, stress free, free range hog, Marian attempts to connect the old world to the new in his truly artisanal products. Translated 'the winemakers', Vinarska is named after Marian's Grandfather Josef Moncek, a keen winemaker. 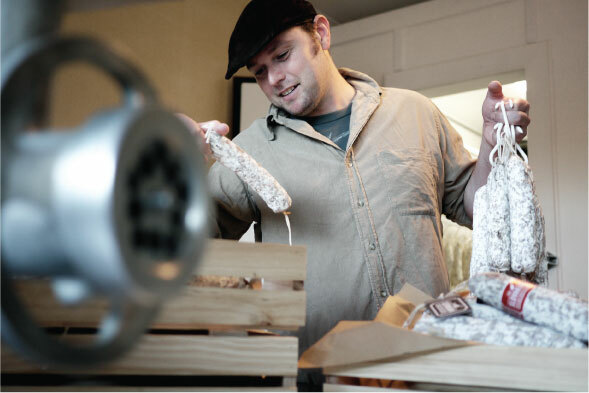 Josef Moncek used to make this pure sausage, relying on its flavours from quality pork, black pepper and a long and steady fermentation process. A long curing time allows for reverse fermentation. Inspired by the Spanish style of sausage making. This is a strong flavoured, robust and spicy sausage made with Pimenton de la Vera, garlic, black pepper, cayenne pepper and anchovie. It is well accompanied with Chenin blanc or Savingon blanc. Translated 'wine and sage', Vino a Salvia is a sausage with sage, a pinch of black pepper and a high quality wine of Marian's choice, either Merlot or Cabernet Sauvignon. Vino a Salvia is a variant of Marian's grandfather's Vinarska, taken a step or two further. This sausage made exclusively from pork loin, with the addition of black pepper, presents a bridge to the old world. Once upon a time requested by the Queen of England and France, the meat for this sausage is still hand chopped with a knife, and thumb stuffed into casings. We take our meat seriously and only purchase the best, stress free, free range hogs available to us. Farms such as Loganshire and Happy Hog, where we get our meat from, follow organic principles by harnessing natural processes and reverting to the proven methods of 'yesteryear'. Through their holistic approach to farming, they do their utmost to maintain a healthy ecological system and thus conserve the biodiversity of the farm and surrounding ecosystems. Reverting to time-worn techniques, by farming slowly and simply, without chemical intervention and utilising all of nature's benefits, they have created a sustainable environment... one which is perfect for the pigs. They add neither herbicides nor pesticides to either the soil or crops and avoid medical intervention for the pigs - so you can be sure that there are no nasty chemical surprises to contaminate either the land or their meat. They believe (and we agree) that what goes into their pigs should be natural and free from additives - so that what you taste is a wholesome product distinguished by its superior flavour and a good balance of fats. 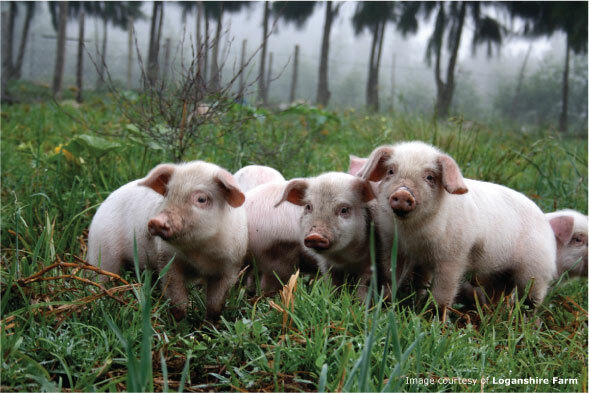 After weaning, the pigs are free to forage in the fields, roam around the farm, roll in the mud and grow into the kind of robust animals perfect for our products. © The Slovakian - Renaissance Charcuterie Moncek 2012. All rights reserved.